This is Amanda, a 29 years old massage therapist. Her husband works 7 days a week, while she takes care of their young child and their dog Lola. I met her when she was mowing the lawn. She was willing to pose for me after she had a few minutes to freshen herself up. 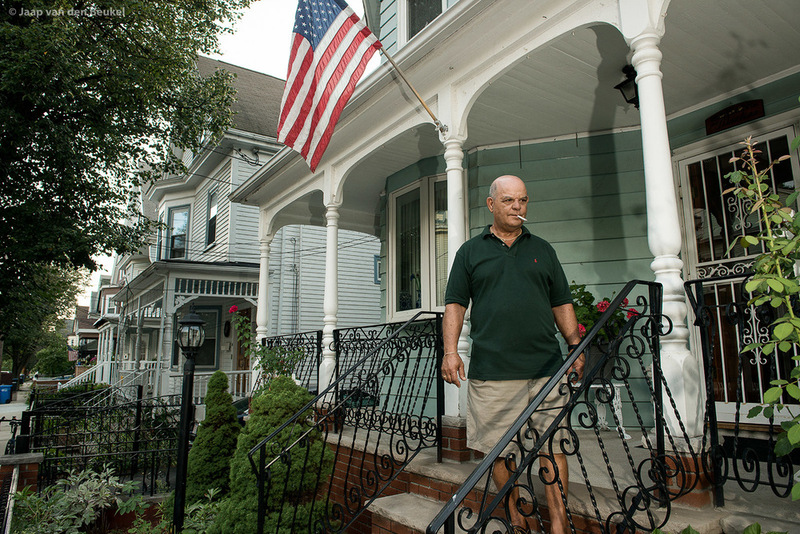 George is the proud man in front of his house in Somerville. This friendly man is originally from Portugal, but has been living in the US already for 54 years. No Portugese flag, this would make things a bit complicated. He apologized for the state his garden was in. For me actually it looked quite allright. Doing the maintenance at the Boston University for already more than 30 years. Still having another 5 years to go, he wishes this would be much shorter! Don, 64 years old, administrator at a Behaviour Health Clinic. He had his arm in a sling for a few months, because he got injured in an accident. Today was the first time he could use both of his arms normally again. When I just arrived at my destination in Somerville area of Boston, I met Moses a 41 years old programmer. This young man told me he bought his house a few weeks ago. Because I was just coming back from the country side, with the big houses and their huge gardens, I was impressed by the way he was taking care of his tiny little garden. This is Alan, 84 years, a former mechanical engineer. He has been retired for a long time now, because of knee problems. He lives with his son and helps him fix any problems with his motor bike. Armando just turned 89 years old. I met this Italian man when he was asleep in his white chair. When I was contemplating if to take his picture, he woke up. We had a little chat. He worked his whole life as a bricklayer and is now enjoying his retirement. Blanca just came back from her work at the laundrette. Everyday she starts at 6am. Even though she was rather tired, she still had the energy to pose for a few minutes. She lives with her sisters and their children in the same house. We were talking Spanish. I liked the red shirt against the white house and of course her tattoo. This is Eric…..he was willing to pose for a few minutes, but didn't want to give any further details about his life. He only told me he likes to draw. He gave me a little drawing. William, 64 years old, worked in a bakery when he was still young. Because of mental problems he was not able to work anymore. 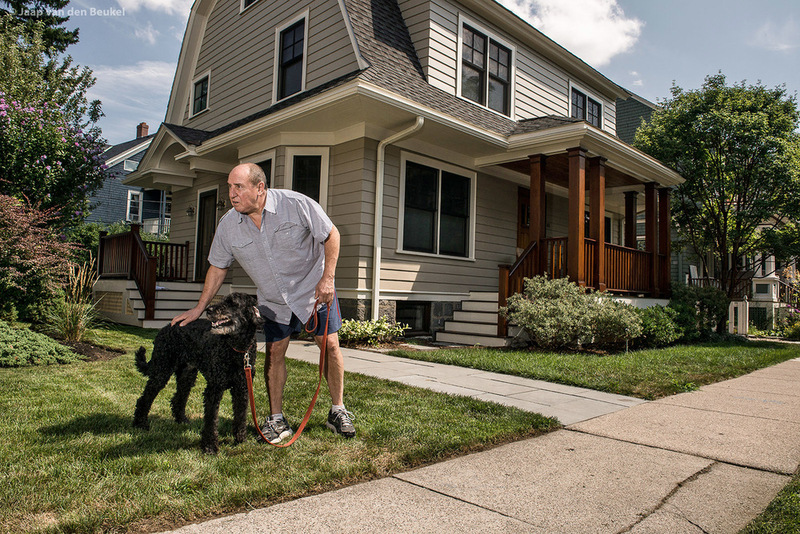 His favourite place to stay is in front of his house, "cause where else can I go?" Aangeharkte tuinen, dubbele garages met een enorme oprijlaan en natuurlijk de nationale vlag. Elke zaterdagmiddag gaan Amerikanen in de middenstandswijken massaal hun gras maaien. Achter het huis blijkt zelfs nog een grotere tuin te zijn. Met prachtige veranda’s waar nauwelijks gebruik van wordt gemaakt. De Amerikaan is meer bezig in zijn tuin te werken dan dat hij er volop van geniet. De tuinen zien er soms zo netjes uit dat het surrealistisch aandoet. Zoveel grond, maar je ziet er bijna nooit iemand rondlopen. Wellicht omdat Amerikanen een stuk minder vakantie dagen hebben dan wij? Of gebeurt dit alleen als de barbecue aangaat? Ook in de stad zelf veel verzorgde kleine tuintjes, soms afgewisseld met een verpauperde woning met hoog gras. Het intrigeert mij omdat ik zelf in een appartement in Amsterdam woon zonder tuin. Vijf dagen lang ben ik gaan fietsen door Boston en omgeving. Hierbij heb ik veel mensen aangesproken die bezig waren in hun tuin, en soms lagen te slapen, of gewoon voor zich uit zaten te staren. Het mondde uit in bijzondere gesprekken, waarin ik binnen een mum van tijd onbekende personen een klein beetje leerde kennen op de plek waar zij zich thuis voelen. Carefully tended gardens, double garages with a huge drive and, of course, the national flag. Every Saturday afternoon all the Americans in their suburbs jointly mow their lawns. At the back of the house appears to be an even bigger garden. With beautiful, hardly used verandas. 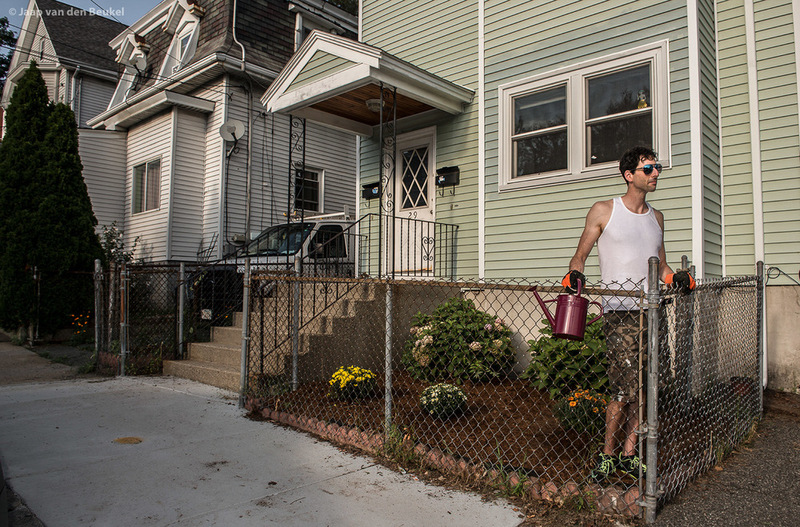 The American is busier working in their garden than enjoying it. The gardens look so tidy that it is almost surrealistic. So much land, but you hardly see anyone walking around in it. Maybe because the Americans have a lot less annual leave days? Or does this only happen when they light the BBQ? Also in the city many neat little gardens, sometimes alternated with a dilapidated house with high grass. It intrigues me because I live in an apartment in Amsterdam without a garden. For five days I cycled through Boston and its suburbs. I spoke to a lot of people who were gardening, asleep in their gardens, or just sitting around in it. This ended in special conversations in which, within no time, I got to know strangers in the place they felt happiest in.